"Chantée Introduces The Champagne Opener"
Cleve Crudgington and his wife Gloria gathered every Saturday afternoon in their courtyard to drink sparkling wine with friends. Soon however, Cleve, as well as the other champagne enthusiasts, noticed that Gloria became fearful whenever a bottle was opened. After two or three meetings of the "Korbel Club," Gloria's apprehension seemed to build and was obviously limiting her enjoyment of the festive occasions. And Cleve, in reaction to her fretting, became annoyed as she made him feel like he was defusing a dangerous bomb. Finally Gloria revealed that she had a pronounced fear of champagne corks due to an unfortunate incident during her childhood that had left a lasting impression. She recounted that for a major wedding anniversary, her uncle had purchased a bottle of excellent champagne to toast his dear wife. Not being a connoisseur, he had no idea how to open it. Tragically, her uncle while looking directly over the bottle as he was twisting the cork, was killed instantly when the shooting cork struck him in the face. 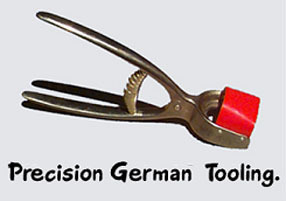 Cleve pondered, "There must be a tool that would make the occassion celebratory instead dreaded. Hmm." And so the Champagne Opener was invented. Within days of conceiving the idea, Cleve contacted a friend who made a quick prototype just to see if the idea would work. Once satisfied, it was time to build a top quality prototype one that could be used as a guide for production. Cleve contacted a local craftsman who, with German precision, machined a sturdy device out of two blocks of steel. By then Cleve was confident that a worthy and marketable product could be produced, one that people would enjoy and appreciate using. 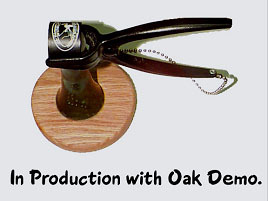 Initially, the reputation of The Champagne Opener spread mostly by word of mouth and sales representatives. In recent years the internet has been a major influence in spreading the work. 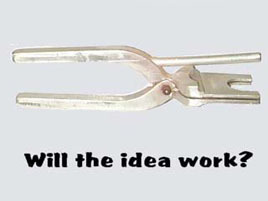 In 2006 patented improvements were made to make The Champagne Opener even better. Today major chains, independent gourmet kitchen, better wine stores and wineries carry The Champagne Opener. 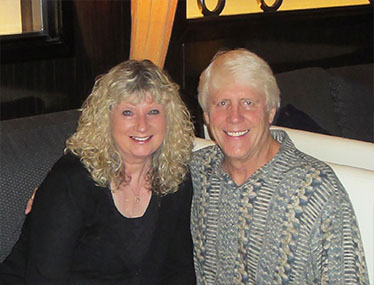 To this day, Cleve Crudgington, along with his wife Gloria, continue to operate the family owned business in their hometown, Monrovia, California. The making of the animation "Chantée Introduces The Champagne Opener"
After teaching computer animation part-time at Mount San Antonio College and Pasadena City College for over 10 years, Cleve thought it would fun to tap into the skills of several of his best students and put together an animation for his business. Cleve worked closely with Andrew Galassi who developed Chantée and produced all of the animation that you see in the video. Andrew once again showed his innate ability to infuse a charming personality in the characters that he creates. Cleve first contacted Andrew Galassi in 2010 after recalling the superior skills Andrew demonstrated in his Maya Dynamics class at Mt. San Antonio college in the Fall of 2006. The first class project involved designing in 3D a bowling ball complete with pins and a bowling lane. Students were required to set the ball in motion and knock down some or all of the pins. Unlike most of the other students who just made a moving bowling ball, Andrew showed exceptional skills by designing a character that tossed the ball. 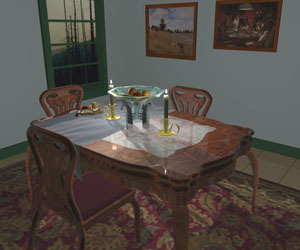 In a beginning modeling class at Pasadena City College, the final project required the students to design and build in 3D space a diningroom table and chairs, with a cutting board including cheese and knife, a bowl of fruit and several candles with holders. As you can see, Carlos demonstrated exceptional skill in modeling and texturing for his final class project. And his dining room became the perfect backdrop for Chantée to demonstrate proper use of The Champagne Opener. Notice how the scene changes from daylight to candlelight when Chantée talks about those romantic occasions.